In honor of Earth Day, Local Electrical will educate you on the value of converting your home’s lighting to the new energy efficient CFL light bulbs. Compact fluorescent lamps, or CFL’s, emit light when electricity ignites the mix of gases inside the bulb, creating high energy, invisible, ultra-violet light, which is absorbed by the bulbs fluorescent coating and transformed into visible light. CFL light bulbs meet the energy standards set by the 2007 light bulb law that was designed to make screw-in light bulbs more efficient. 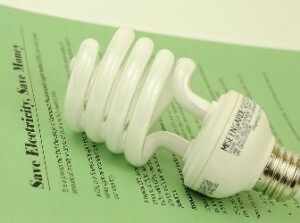 The law is being phased in over three years and refers to the manufacture date of the light bulb. In other words, if you have the older light bulbs, you don’t need to throw them away. But when you buy new light bulbs, you should look for the newer energy efficient models. CFLs are quickly becoming the low-energy bulb of choice for those concerned with the environment and want to reduce their energy bills. CFL light bulbs emit the same amount of light as incandescent light bulbs but use 75% less energy and last approximately 10 times longer. And although the cost of the bulb is slightly higher, its longer life span and less energy usage will result in lower annual costs. Choosing the right CFL lighting for your needs can be confusing. Light brightness and output for CFL bulbs are measured by “lumens” rather than “watts” which is used to measure output on incandescent bulbs. Home Depot offers help on choosing the right size, color temperature and brightness to ensure you replace your old incandescent bulbs with the ones that suit your lighting needs. The three year phase in of the light bulb law is only the first part. By the year 2020, bulbs will be required to be 60 – 70% more efficient than the standard incandescent bulb. The CFL light bulb meets this requirement today. If you want to be ahead of the game, begin converting your home to CFL lighting that meets the energy requirements now and save money for your and the planet for your children.